Find yourself struggling to stay on top of the never-ending to-do list? Or maybe you’re having a difficult time tackling projects? Thanks to Basecamp you can delegate, manage and never miss another deadline. In 1999, a software development company called 37Signals created Basecamp for internal project management for their programmers, including co-founder Jason Fried—they found it so useful themselves, they offered the service to others. 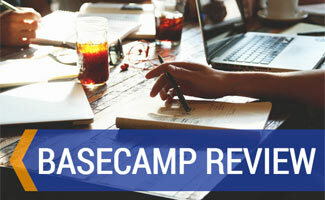 After its rapid success and several products later, in 2014 they officially re-named the company “Basecamp” and have been solely focused on it ever since. Learn more about the basics of Basecamp, why people love it so much and how you can get started (for free). 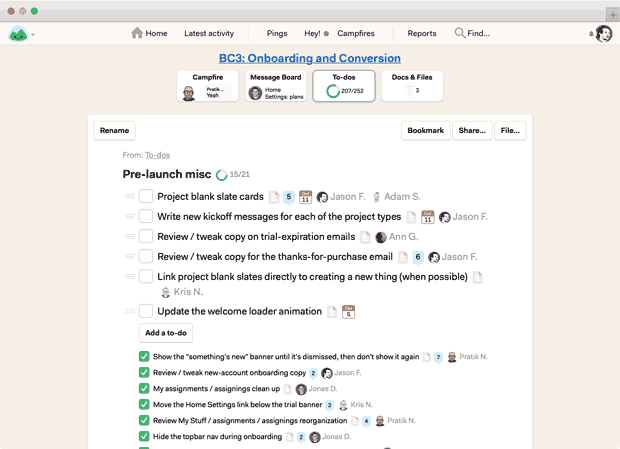 Basecamp is a simple-to-use online project management tool. It doesn’t require any software or downloads to use. Just open a browser (or their mobile app) and you can create a project, assign a task and give it a due date. Each project allows you to invite members to participate and users can only see the project(s) they’ve been invited to. There are also message boards to post important information, check-ins, a Campfire chat and more tools to keep everyone on the same page. Basically, instead of having your inbox be your to-do list, you can go to Basecamp to see what tasks are the highest priority by viewing your assignments and due dates. It also helps thread together conversations about a particular topic so they can be archived (and searched) for future reference. Then, loop people in if and when the task becomes relevant to them and they can reference the history of the conversation for context without you having to fill them in. Basecamp is perfect for freelancers and small to medium sized businesses. It’s especially ideal for virtual teams and people of all experience levels because it has a low learning curve. And since developers created it, many fellow coders are fans of Basecamp too. There are three versions of Basecamp: Basecamp Classic, Basecamp 2 and Basecamp 3. They’re all somewhat similar regarding capabilities and features but since Basecamp 3 is the latest and greatest we’ll be reviewing it. If you’re asking yourself why are there 3 versions? Rest assured we wondered the same thing. Long story short – there used to not be an upgrade path (now there is), so users had to start new projects in the new version while they phased out on the old version (which was then provided for free so you wouldn’t be double billed). Now that there is an upgrade path, they’re still pledging to maintain all versions forever (simply because some users prefer the older versions we suppose). We’ve been avid users of Basecamp since 2012 to manage all our projects and tasks here at We Rock Your Web, so we’ve seen it grow and evolve over the years. Since we’re so intimate with the product, we have some additional suggestions for Basecamp that we think could make it even better. The good news is, Basecamp actively listens to user feedback and implements suggestions (albeit only in the latest version, in this case Basecamp 3). So hopefully some of these will be implemented soon (if not already). Have any other fixes or ideas you’d like to see in the mix? Either let Basecamp know via Twitter or comment below and we’ll add them to our list (if we agree 😉 ). Basecamp’s fixed-fee pricing means you don’t have to worry about how big your team is or how many projects you have. Basecamp costs $99/month (or $1,000/year) for unlimited users, unlimited projects. 50% off for non-profits and charities and it’s free for teachers and students. What do other customers think of Basecamp? See below for a sampling of user feedback we found online. Check out the video below to see how Basecamp works in action. I have personally used Basecamp since 2010. 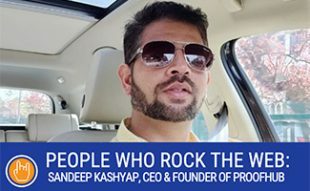 Over the years, I’ve convinced several others to join the bandwagon, including the team here at We Rock Your Web as mentioned above. 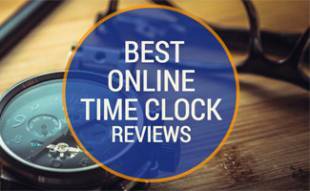 Although we’ve reviewed and tested several other project management software tools along the way, we’re still loyal to Basecamp over Basecamp competitors. We love that it gets work done without creating more work for ourselves in the process. We’ve tried Basecamp alternatives and found that we didn’t need all the bells and whistles (however we encourage you to read the article, try out alternatives, and decide for yourself!). It’s worth noting that we don’t use the Campfire chat feature (we use Slack instead, one of our Best Online Collaboration Tools) or check-ins (we have weekly Google Hangouts for that). And while we have a growing wish-list of things we wish they’d change or fix, for the most part, we make do because the rest of it is so great. Is Basecamp Right for Your Business? When it comes to project management, there is no perfect solution. Every team is unique and everyone has personal ways of doing things. Try it out risk-free for 30 days and play around with a few test projects to see how you like it. And hopefully, your company will start seeing the same productivity gains we did. How do you currently manage projects and to-dos with your team? LOOVE Basecamp, they’re the best! I seriously don’t know how I survived before them. I’ve used with multiple clients/jobs and everyone is so easy to catch on. It archives everything in one place without using my precious email storage with attachments too!